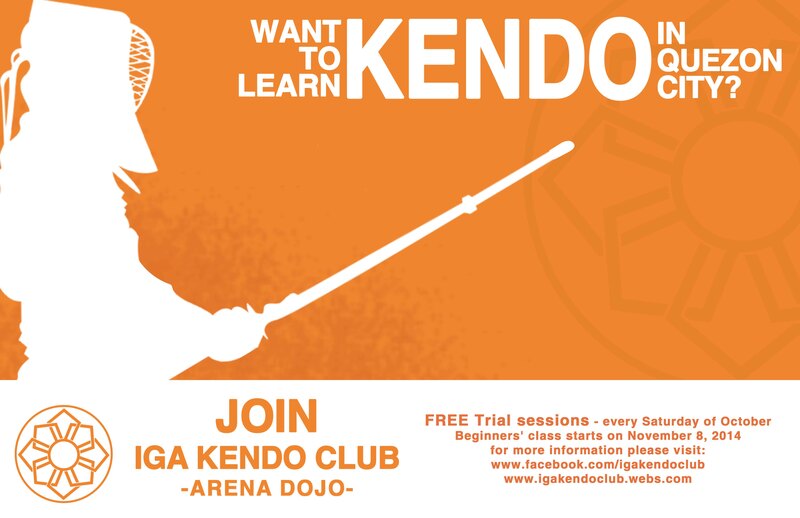 The IGA Kendo Club is opening it’s doors once again to beginners interested in learning the art of Kendo! 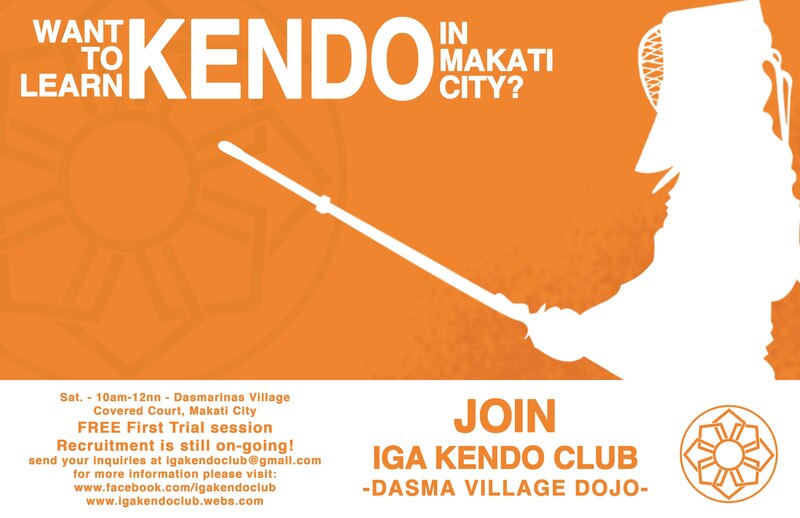 We are offering two open classes, one in the Dasma Village Dojo in Makati, and the other in the Arena Fitness Dojo in Quezon City. For more particular on how to join either dojo, please keep on reading. And if you do decide to visit us, please answer the Google Form linked at the end of the article so that we will know to expect you. 1) Drop by any Saturday from 10am – 12nn (though we recommend that you be early, at least 9:45am) starting October 4, 2014. You can either just visit to watch a session or do a one-time free trial session. If you will do the trial session, bring a set of comfortable work-out type clothes, and we will lend you the rest of the necessary equipment. 2) After watching or doing the trial session, you should decide on your own whether you will join the club or not. 3) Should you decide to join, just show up on the next Saturday to start regular training. You will have to register with the club, pay the initial club dues, and buy a personal shinai (bamboo practice sword). 1) The formal beginners’ class will start on November 8, 2014. However we will require prospective beginners to attend one of the free trial sessions we will holding every Saturday of October from 2pm – 4pm. If you will attend a trial session, please bring a set of comfortable work-out clothes, and we will lend you the necessary equipment. 2) After the trial session, we will ask you to fill out a wait list form. This will show you have indeed attended a trial session, and are therefore eligible to apply for the November Beginners’ Class. Decide by yourself if you will indeed push through, and wait for November 8. 3) We will only be accepting 15 students maximum for the class, due to space restrictions in our venue. This will be decided on a first come, first served basis. A sign up sheet will be left at the front desk of Arena Fitness, and the first 15 students to sign up (with a proper wait list form) will be accepted. 4) Once you are accepted in the class, you will have to register with the club, pay the initial club dues, and buy your own personal shinai (bamboo practice sword). For those who are interested in joining, please fill out this Google Form so that we can expect you to visit us. You can also send any questions you have on the form. This entry was posted in Recruitment and tagged Arena Fitness Dojo, Arena Fitness Inc, Dasma Dojo, Dasmariñas, dasmarinas village, Dojo, Iga ken, Iga Kendo, IGA Kendo Club, kendo, Makati, Philippine Kendo, Philippines, Quezon City. Bookmark the permalink.